I’m a pretty light sleeper but I’ve found some things that help. I always take ear plugs with me when I travel, for example, and at home I have a fan that I run in the summer months because the whirring helps drown out noises. 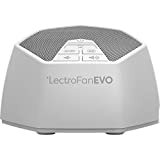 I’ve always been a bit skeptical of sound machines and I’ve tried a couple that didn’t work out, but the Adaptive Sound Technologies LectroFan Evo Sound Machine completely sold me on them. This awesome little gadget plays 22 unique sounds that are all non-looping so you never hear that annoying break. It has 10 different fan sounds, 10 white, pink and brown noise variations, and two different ocean sounds so that it can cover all the bases. Provides ten fan sounds, ten white, pink and brown noise variations, and two varieties of ocean sounds — calm, and surf.